As highway networks expand, and traffic volume and speed increase, wildlife vehicle collisions are becoming more frequent. Wildlife vehicle collisions are a major concern throughout all of Canada and can result in substantial personal, environmental and economic losses. In British Columbia, the number of wildlife vehicle collisions is increasing and creating serious implications for the conservation and management of all BC's wildlife, including many rare and endangered species. BC Ministry of Transportation and Infrastructure (MoT) statistics show that from 1998 to 2007, 93,853 animals were reported killed on BC highways. MoT estimates that this number may represent only 25% to 35% of the real number of wild animals killed. The actual total of wild animals killed in the ten year period from 1992 to 2002 could be as high as 200,508 or more, which is a staggering number. 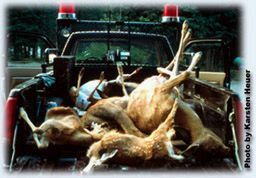 This difference between reported deaths and actual deaths can be attributed to animals dying outside the highway right-of-way, animal remains being removed by natural scavengers or predators, animal remains being obscured by snow, vegetation etc., animal remains becoming unrecognizable after being run over by successive vehicles, and larger animals (primarily deer or moose) being removed by passing motorists. Approximately 80% of wildlife vehicle collisions involve deer. Moose, elk, bears, coyotes and other wildlife make up the remaining 20%. Collisions with smaller wildlife species are extremely common, but as they cause less damage to private property or human life, they rarely appear in official statistics. Wildlife vehicle collisions represent a serious threat to the motoring public as they cause serious human injuries and fatalities. Over 10,000 wildlife vehicle collisions occur every year in BC, resulting in approximately 570 personal injuries and 3 fatalities. Between 1988 and 2009, 47 people were killed in BC due to wildlife vehicle collisions. The province of British Columbia incurs the costs of highway clean-up and animal disposal on most numbered highways, which resulted in a cost of over $700,000 in 2007. Each year in British Columbia, hunting license sales generate millions of dollars for the provincial government. If every wild game animal reported killed on provincial highways represented a lost opportunity to sell a hunting license, the Province of British Columbia could have lost over $700,000 in provincial hunting revenues in 2007. In addition, there is also the annual loss of the value of the wildlife itself, valued at over $450 million dollars; the value of hunting to the economy, $40 million dollars; and the revenue associated with recreational wildlife viewing, valued at over $390 million dollars per year. All figures are mathematical averages, obtained from past records of the 1Insurance Corporation of British Columbia and the 2British Columbia Ministry of Transportation and Infrastructure.